and a DEDICATION to them that will translate into a lifelong love of dance. This is how our students will earn their WINGS to fly to great heights. Pre-Dance: This class uses children’s natural delight in music and movement to begin teaching listening skills that are fundamental to their dance training. Creative Movement: ​A wonderful foundation for future dance classes, this class focuses on exploring movement using music, props, activities, and all the brilliant creativity of this age group. Ballet: Ballet is a dancer’s foundation. It teaches grace and fluidity as well as discipline and precision. Our ballet is taught from the Cecchetti Method and has been utilized for generations to produce highly skilled dancers. Ballet meets once a week for one hour. Ballet meets 2 times per week for one hour. Prior ballet preferred. 3rd - 6th grade. Ballet meets 2 times per week for ninety minutes. Ballet meets 3 times per week for ninety minutes. Meets once a week for one hour. 6th grade and up, this class will cover the basics of ballet. ADULTS ONLY! This class will cover the basics of ballet. A methodology of teaching ballet. Cecchetti classes are by invitation only. Jazz: Children love jazz class because of it’s energy and freedom of interpretation. Jazz is founded in a firm technical base, however, and therefore it is required that dancers enrolling in Level 3 and higher also take at least one hour of ballet. Modern: This contemporary, barefoot style of dance will allow students to build tremendous strength through full body movements. Various dance qualities will be incorporated as we explore time, space, and energy. Students will gain experience with improvisation and the techniques of Lester Horton and Martha Graham. Students must also be in ballet to take Modern. Level 1 is for beginners. Dancers should be at least 9 to begin Modern training. Contemporary: Utilizes Modern and Ballet technique as well as imporvisation techniques. Dancers must be enrolled in Level 2 Modern and Level 3 Ballet to take Contemporary. Lyrical: This lovely dance form takes the technique of ballet and jazz and fuses it together to create emotional choreography. Dancers must have had at least one year of ballet and be currently enrolled in a ballet class. Hip Hop: Helps develop musicality, isolations, and free style movement. Hip Hop is NOT the same as jazz. It has its own history and culture. 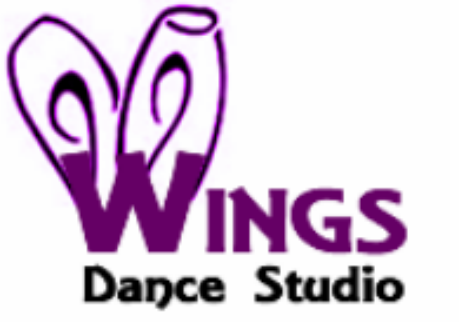 All music and movement will maintain Wings dedication to appropriate choices for children. Dancers younger than 10 will enjoy our Intro to Hip Hop class. Tumbling: Children will learn basic tumbling skills. Acro: This class takes the basics of tumbling and refines them for use in choreography. Flexibility and tumbling skills will be learned. Tap: This legendary dance form is all about the rhythms made with the taps on the heels and toes.